1863. 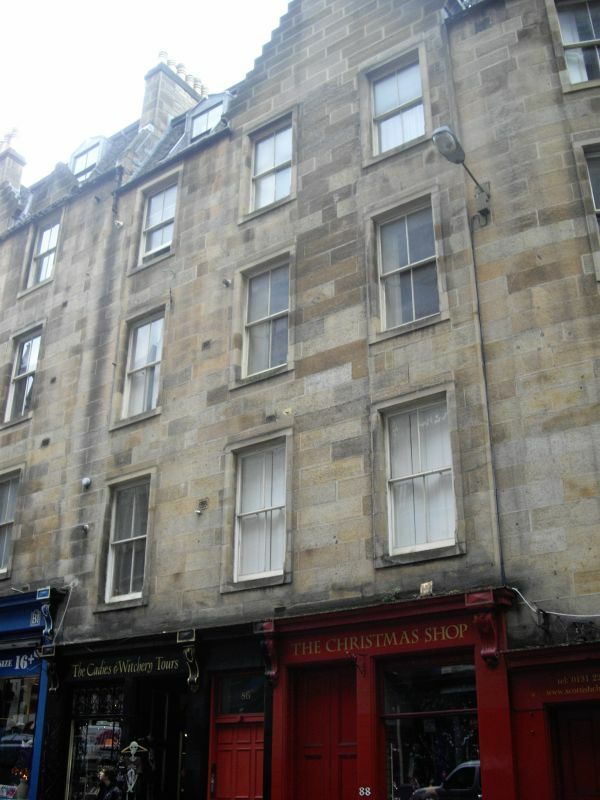 4-storey and attic 3-bay tenement with shops to ground floor, stepped with slope of street. Coursed cream ashlar (painted to ground). Decorative consoled cornice to ground floor. Stop-chamfered margins to doors and windows. Timber panelled door to flats at centre with plate glass fanlight; 2-leaf timber panelled storm doors to shops in flanking bays; shop windows in outer bays. Regular fenestration above. Crow-stepped wallhead gable to 2 right bays with corniced apex stack. Modern inset lead dormers to mansard roof. 4-pane glazing in timber sash and case windows. Graded grey slates. Corniced apex stack with circular cans. Rather plain tenement; only the crowstepped gable hints at the 'Old Flemish style' specified in the 1827 Improvement Act.